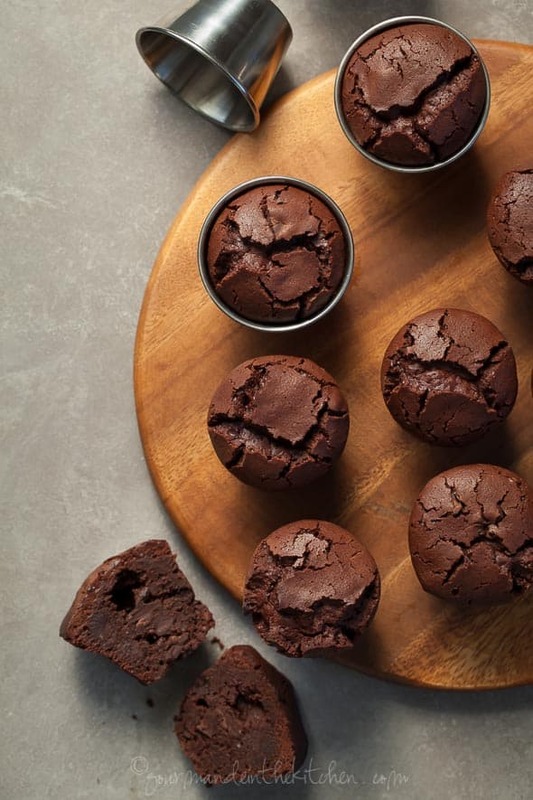 Intense, fudgy, bite-sized flourless chocolate cakes. 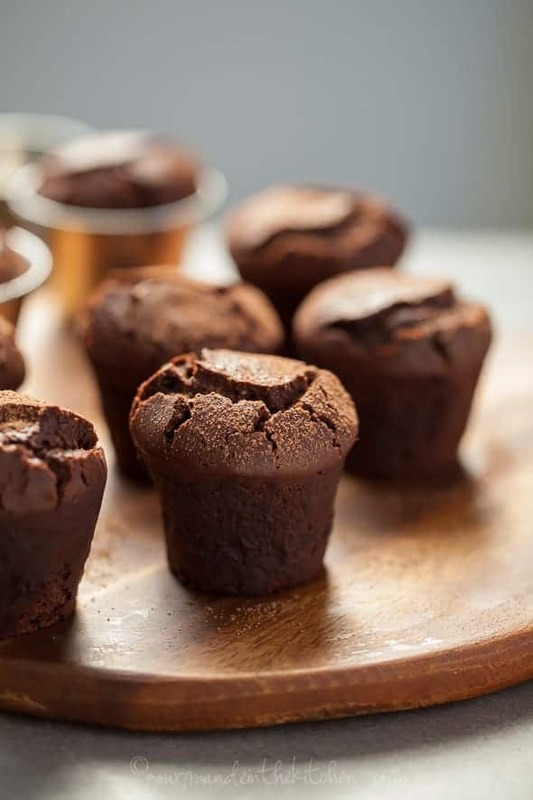 These are no ordinary chocolate cakelets. 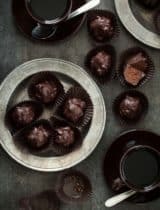 These small, bittersweet flourless chocolate bouchons with their crackled tops are dense and fudgy to the core, every bite positively oozing with chocolate. 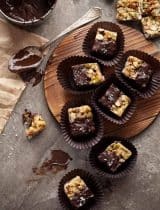 With bittersweet chocolate both melted into the batter and chopped into chunks, they are the ultimate fix for any chocolate craving. Best of all, they are made in about 30 minutes, which means you’re never very far from biting into one when the urge strikes. 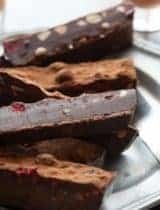 The richness and intensity of all that dark chocolate coupled with those dense, meltingly tender centers is enough to make any serious chocolate lover (myself included) weak in the knees. 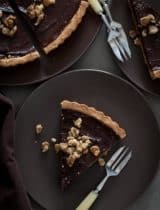 The texture lies somewhere between fudgy and creamy like a good flourless chocolate cake should. In the oven the tops crack and rise up over the molds, making each look a little like a champagne cork (called bouchons in French), hence their name. 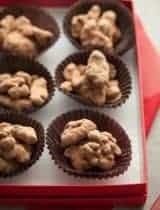 Cut one open and you’ll find pockets of melted chocolate in a tender truffle-like center. 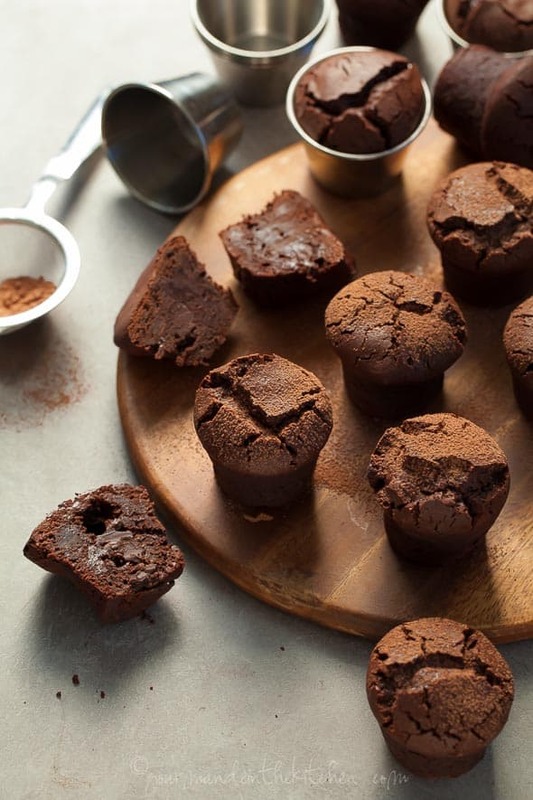 Top the bouchons with a light dusting of cocao powder for a pretty finish and serve them while still slighty warm for a special treat that’s elegant enough for company but easy enough to make any day of the week. Pre-heat oven to 350 degrees. Grease and dust eight 2.5 -ounce stainless molds (or mini muffin molds) with coconut oil and cocoa powder. Place molds on a baking sheet. 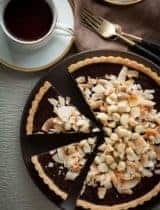 Melt 5oz of the chocolate and the coconut oil in a double boiler over low heat, stirring constantly until smooth. Remove from heat and set aside. Beat eggs coconut sugar, vanilla and salt together at medium speed with a mixer or whisk, until pale, foamy and thickened. On low speed, mix in the cooled melted chocolate mixture and beat until glossy. Sift in cocoa powder and arrowroot powder and stir to combine. Gently fold in remaining 2 oz chopped chocolate. Using a spoon, fill each prepared mold about ¾ full. Bake 15-17 minutes, until tops are shiny and cracked but firm. Transfer molds to a rack to cool. Tap on the sides to unmold, dust with cocoa powder if desired and serve. These look amazing! I love how simple delicious ingredients can make the best stuff! Thank you for this recipe - my girls will love this! These sound fabulous and the photos are lovely, as always! Mmmmm so rich and fudgy! I'll take 2, please! These are absolutely stunning! I have to give them a try in my mini muffin tin! Wow these are beautiful! I bet they taste amazing! 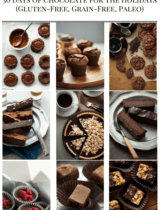 Love this recipe especially that you made it paleo. Um, these are so adorable - both in name and looks! OMG these are adorable and sound SO good. Love that they're flourless! Oh my gosh - you are killing me with these little munchkins! LOVE! Oh I want to try these right away. I have big chocolate cravings lately and these will be perfect. No way, these looks positively scrumptious! I am loving these so much! Those crackled tops! That melted chocolate! A chocolate lover's dream come true. Amazed they are grain free! These look incredible! Thanks for sharing!